It is difficult to anticipate the dangers of cold weather when it has reached 60 degrees this week. The fact is this warm weather can make cold spells even more dangerous to your pet! 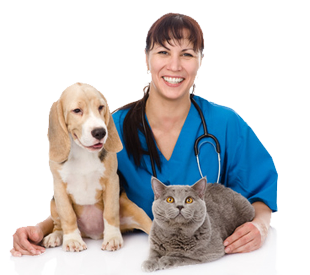 The sudden drop in temperature that occurs is harder on the pet’s system when there has been no time to acclimate. These sudden changes also leave owners unprepared. Pets need a windbreak when outdoors and also need fresh water that has not frozen. Even outdoor pets should be brought in to some warmer area during severe drops in temperature that are uncommon for this area. Indoor pets still want to go outside to go to the bathroom but severely low temperatures and wind chill can make it difficult especially for smaller pets and pets under a year old or very old pets. Some dogs may need to use the garage for a bathroom if their feet get cold or deep snow upsets them. Antifreeze is another danger of this time of year. Spillage when adding ethylene glycol antifreeze to a radiator can be enough to poison most cats and some dogs. It should be cleaned up immediately since it often tastes good to the pet. Antifreeze is very deadly and can quickly cause complete kidney failure. If you witness your pet ingest antifreeze you must go to the vet at that time before any symptoms occur to successfully treat the poisoning. Christmas trees, fireplaces and wood burning stoves can trigger allergies in pets when they spend more time indoors. Itchy skin along with eye irritation and respiratory symptoms can all be seen. Holliday decorations including poinsettias can also be hazardous if pets are able to chew or ingest them. 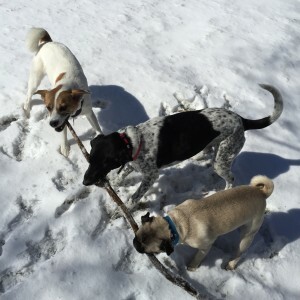 Winter can be fun for your pet especially if they enjoy snow like my three dogs do!